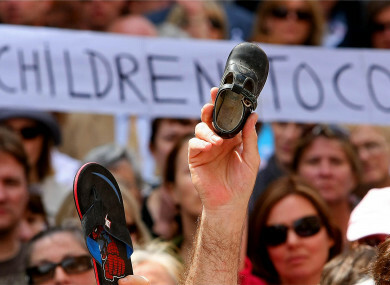 A child's shoe is held up as thousands of victims of institutional abuse survivors during the silent demonstrations in memory of the victims in Dublin city centre to the Dail in 2009. The work of the Residential Institutions Redress Board and the process of payments to victims has cost over €1.1 billion, while the total awards granted has cost €970 million. The figures are contained in the board’s annual report, which was considered by Cabinet today. The Redress Board was set up in 2002 in order to make awards to people, who as children, were abused while resident in industrial schools, reformatories and other institutions subject to State regulation or inspection. During its 16 years in operation the Board has processed 16,650 applications for awards worth almost €970 million. However, the total of the Board’s work, including when legal fees are taken into account, as well as the payouts, comes to €1.1 billion. The average value of award was €62,250, with the largest being €300,500. Of the 16,650 applications which the Board processed to the end of last year – 12,016 awards were made following settlement; 2,994 awards were made following hearings; 571 awards following review; and 1,069 applications were withdrawn refused or result in a nil or no award. There were 2,211 late applications, received from 2005 to 2011, which were processed. It is understood that no claims are outstanding to date. The Board is due to be dissolved, but that is dependent on the outcome of a Judicial Review to be ruled on by the Supreme Court, most likely next year, and the enactment of the Records Retention Bill. The General Scheme of the Bill, approved in 2015, allows for records to be kept from the Commission to Inquire into Child Abuse, the Redress Board and Review Committee, the government. Drafting of the Bill is complete and a memo on publication will be brought to government shortly. Email “Redress Board work cost €1.1bn, while abused residents in industrial schools get €970m”. Feedback on “Redress Board work cost €1.1bn, while abused residents in industrial schools get €970m”.